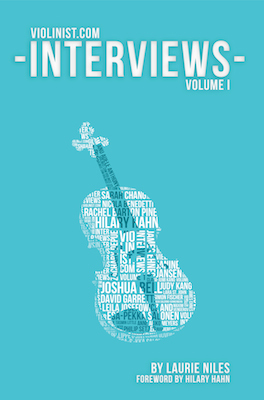 Violinist.com Interviews, Vol. 1 is now available! Though this is a long list, I still was not able to include everyone that I wanted to include, which is why I've called this book "Volume 1." As I assembled this collection, I was pleased to find that far from being 27 completely separate stories, there are a great many threads that connect one violinist's story to another's: common teachers, repertoire, experiences, approaches -- even instruments that start in one violinist's hands and end up in another's! At the same time, there is great diversity of thought as well; for example, the story of James Ehnes' arduous search for just the right instrument contrasts completely with Nadja Salerno Sonnenberg's humorous banter on the same topic. What kind of violin do you play, Nadja? "I play a used one," she said, "I found a good instrument and I just stuck with it. There are better instruments out there, certainly there are worse instruments, but I feel fine." Some of the interviews are several years old, and one can see that the seeds of the future lie in the things that violinists said years ago. For example, Anne Akiko Meyers speaks in 2008 of having to borrow many instruments in her early career, and how returning them was "like having your left arm amputated." She now quite famously has been guaranteed lifetime use of the "Vieuxtemps" Guarneri del Gesù. The book also contains a special interview with Ruggiero Ricci, which I did with him in 2007, just five years before his death. Each interview has an introduction, written especially for the book, that makes some of these connections and brings the reader up-to-date with a developments that occurred with the artist after the interview. So I invite you to buy our book! If you buy a paperback copy of the book through Amazon, you soon will be able to add a Kindle version for just $2.95, under Amazon's Kindle Matchbook program. This business of publishing a book brought me to another question, one that I'm making into this week's "Weekend Vote": Do you prefer to read paper books, or e-books? I feel like this difference has less to do with age that it does with personal preference. For example, my teenage daughter, certainly a member of the "digital native" generation, prefers paper-and-print books to her Kindle. In fact, her tech-savvy grandfather has pushed two separate Kindles her way over the years, and she's completely rejected both. She just prefers the feel and the look of a "real" book and loves visiting used book stores, where she can scoop up of a pile of old paperbacks. That said, her grandfather -- who is of a generation that grew up with print books -- fully believes that "there will be no print books" in the future and that the e-book is the best and only way to go. I can see both points. I have a Kindle (the easy-on-your-eyes older model), and I love to read the New York Times on it, instead of reading the paper either on newsprint or on the Internet. I enjoy taking it on the plane because it is so compact and lightweight, yet can carry dozens of "books" in it. At the same time, I don't feel I can flip through the Kindle in the way that I can flip through a paper book. Yesterday, I showed my book to a long-time student, one that has never taken a huge interest in the larger world of violinists. As she leafed through it, she said, "I think I just want to look at the pictures." But as she was examining each picture, she started asking, "Who is this? What is her story? What is his story?" Even as libraries go digital and the world goes digital, I still don't ever want to give up the experience of going to the book store or an old-fashioned library: the smell, the feel, the real-world feeling of a book. It feels like a connection to the past, too: Who held this book before I did, who wrote that note in the margin? So which is your preference these days, when reading a book? Do you prefer it as a paper book, or in e-book form? Schwarz's "Great Masters of the Violin," Roth's "Violin Virtuosi," Galamian's "Violin Playing as I teach it," Little and Jenne's "Dance and Music of J.S. Bach, or any number of other wonderful references for violinists. Who knows what will happen if Barnes and Nobles kills the Nook (which we happen to have)? The same thing that happens when any hardware or software becomes obsolete. Kind of like Apple's word processing software: files made with it only a few years ago are absolutely unusable. My dissertation? It's gone forever. Thanks, Apple. And by the way, don't expect any better from Amazon and the Kindle: they will just as easily leave you high and dry. March 7, 2014 at 11:26 PM · Scott, I don't mean to derail the thread, but do/did you know that Apple's Pages documents can very easily be saved as .doc or .pdf files, as well as being opened by a later version of Pages (the formatting may need minimal tweaking)? What format did you save your dissertation in? Have you asked anyone or a service to try to retrieve it? How many versions of Pages did you skip? PDFs are pretty future-proof (especially the PDF-A format, A for archive). Libraries, businesses and governments save their files in this format. For this very reason, Adobe will NOT be going away anytime soon (for better or worse). March 8, 2014 at 12:09 AM · Congratulations on the new book! I'm in the real (paper) book camp. I had a Nook. The poor performance of the machine (crashes were frequent), the built-in obsolescence, and the corporate tracking were more than enough reasons to close the online bookstore account and give the machine away. March 8, 2014 at 12:25 AM · A paper copy won't become unreadable as technology changes. It can be lent, copied, written in, read anywhere there's light (even when the power is out, during the day). It has character, and it grows old with the owner. E-books are hard on the eyes; they are power- and technology-dependent, lack personality, and, in general, are pathetic. When you think that many manuscripts from hundreds of years ago are still readable, but I can't access the computer files I wrote less than two decades ago, there's just no ground for comparison. March 8, 2014 at 01:03 AM · I write most things in latex/pdf which should be around indefinetly, if you use microsoft, apple and so on you take your chances, I guess that they will not be around for long. Music is more difficult, there are noteflight and musescore which are free and sibelius and finale which are not, my guess is that none of these will be around for long, save everything in html music variant called something like .xmus, that format should last. When it comes to paper verses ebooks, I much prefer paper, but electronic versions have two advantages: one can make the print large, and there is the problem of the shear bulk of paper, I always seem to be surrounded by books and all sorts of paper, much easier to have it all on a few flash memory sticks, especially when moving house. March 8, 2014 at 04:27 AM · I'm one of the few people I know who prefers ebooks. I am allergic to some commonly used inks, and some paper publications make me sneeze. I also don't like book clutter. Before ebooks, and even now, I tend to accumulate books, magazines, and newspapers, and the resulting clutter makes me anxious, in addition to being allergic. I love that you can organize and store ebooks more easily. I also love that ebooks don't smell or accumulate dust. I really don't understand how people like the smell of old, decaying books and paper. I find that smell creepy and unpleasant, and the dust makes me sneeze, even if the ink doesn't. March 8, 2014 at 08:22 AM · I would be very interested in an Interview of Leonidas Kavakos! If anybody can get him and ask the right questions, then you, Laurie! March 8, 2014 at 02:50 PM · Hi Simon, here's the interview with Leonidas Kavakos, which occurred too recently for inclusion in the book, as did my interview with Midori. Volume 2, for sure! March 8, 2014 at 09:02 PM · Laurie - congratulations! A very enterprising project - I'm sure we all wish you every success. As for ebooks vs paper, I feel it's a case of horses for courses. At home I prefer a paper book for leisure reading, as I guess most would. But if it's something for a quick technical read, the instant delivery and searchability of an ebook can sometimes win out. The same goes for reference books, and for books I'm reading to learn a foreign language, where the instant translation feature of the Kindle can save a lot of faffing with manual dictionary lookups. We need both, so people can choose according to context and preference. And given that most publishing systems can originate paper and electronic versions from the same file, there's really no need for an either/or argument. March 9, 2014 at 01:14 PM · Books: To keep and share and re-read. Real books that are made and can bee seen are best but books that that are available all over and that contain more than 700 pages with no real illustrations are the ones that I "Nook." March 10, 2014 at 03:02 AM · I spend so much damned time in front of my computer already, that an e-book would be a "busman's holiday." Furthermore I don't know why I would need to buy an e-book when I can read the interviews right here on v.com. March 14, 2014 at 11:55 AM · Electronic publishing is fine for newspapers, magazines and all kinds of ephemera: consumed and discarded en masse. Think of the paper they save! But a stand-alone, non-electronic information retrieval system (aka "a book") will always have its place. I have thousands, including those that once belonged to friends and family in addition to purchases made since childhood. Seeing my mother's hand-writing in the inside cover, or my father's notes in the margin brings back so many fond memories. They make such wonderful gifts to offer and receive, too.